It’s unlikely that 1st Viscount Gordon Hewart has ever figured prominently in the thoughts of Clyde fans. But he should do this week. It was he who, as a sitting judge in the 1930s, famously ruled “justice must not only be done, it must be seen to be done”. Patently that’s not something Scottish football authorities seem to have adopted when it comes to Clyde and their now infamous points deduction. The Bully Wee are raging at the severity of the SPFL punishment, which the Scottish FA’s Judicial Panel has now failed to overturn. And rightly so. I get ‘them’s the rules’ and that Clyde are guilty of a technical irregularity. But it seems that none of the many mitigating factors have been taken into account. In effect Clyde have been punished for fielding a bona fide Clyde player in a Clyde match. Declan Fitzpatrick - and the unfortunate effect of all this on an innocent young footballer should not be ignored - was recalled from a loan spell with Clydebank Juniors due to an injury crisis. Having been playing in central defence, he was pitched in against Albion Rovers and asked to perform in an unfamiliar striker’s role. It’s hardly the definitive case of bringing in a ringer. While admitting that the regulations mean he should not have played, Clyde have quite rightly raised a host of other issues surrounding the SPFL judgement. Why, if there are checks in place to ensure team line-ups are compliant with the rules, were Clyde not told of the problem BEFORE their next match with Queen’s Park when they fielded Fitzpatrick again, unaware of the coming storm. How was the annulment and awarding of the match 3-0 to their opponents arrived at? When Hearts breached the rules in this season’s Betfred Cup they were docked two points from a game they won. The point they kept proved enough to make sure they went through to the knockout stages. Without it they would have been out at the group stage. And when Peterhead breached the rules in 2014 they were ordered to replay their game with Ayr United. There was no points deduction “in the interests of sporting integrity and fairness to both sides”. Yet Clyde were handed two 3-0 defeats with no explanation of how this was arrived at. Justice SEEN to be done? Mmm. What would have happened if Clyde had lost either of the matches 4-0? 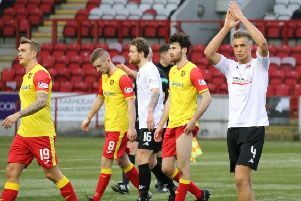 And, with all due respect to Albion Rovers and Queen’s Park, why are they deemed worthy of 3-0 wins because of a Clyde administrative error. Do the SFPL really believe that Declan Fitzpatrick’s presence gave the Bully Wee such an ‘unfair’ advantage. Against Albion Rovers he did well, but against Queen’s Park - and again with all due respect to the player - he was largely ineffective and was subbed midway through the second half. And what of the effect on other clubs who had nothing to do with either match but for whom there are potentially major repercussions. 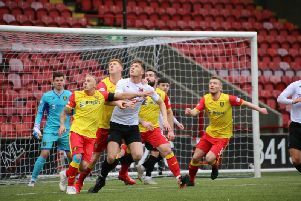 How will Berwick Rangers feel if they lose their league status by being relegated as a result of Albion Rovers being awarded three points for a match they lost? The one benefit Clyde have derived from all this is the players now seem more united than ever, perhaps driven by common goal to right a perceived injustice. Not that they weren’t showing signs of that before. Since losing to Peterhead at the end of October Danny Lennon’s side have suffered just one on the pitch loss in 20 matches. And that came at Elgin on the day the players were undoubtedly affected by learning of the hammer blow to their promotion hopes dealt by the SPFL that morning. That’s a phenomenal run by any standards. If there is any justice it will lead to Clyde being promoted at the of the season on their own merits, by their efforts on the pitch. And that will be a form of justice which will be seen to be done.